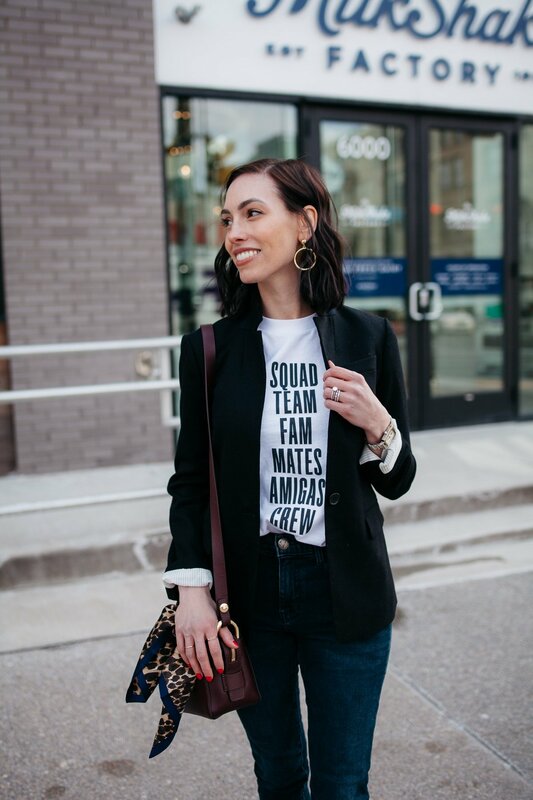 A good graphic t-shirt should not be overlooked as a wardrobe staple and today’s post is centered on just that: three ways to style a graphic t-shirt and blazer. First of all, I’m no stranger to the graphic tee or the blazer. In fact, this combination was one of my first ever blog posts! I have a handful of both in my closet right now, some of which have been staples for years–to the point that the material is starting to thin and they’ll need to soon be retired. That being the case, I couldn’t help myself but give them the attention they deserve–with a fully dedicated blog post. 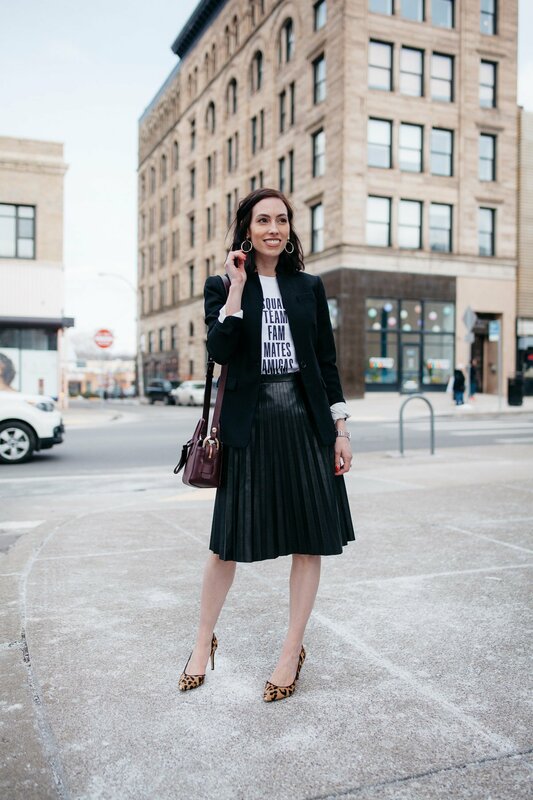 Especially with spring just around the corner, there’s something so refreshing about a great cotton t-shirt and blazer for just about anything on your agenda. Taking this combination from work to weekend is as simple as swapping out your shoes and bottoms. I didn’t even bother to change up my accessories, and still created three very different looks. 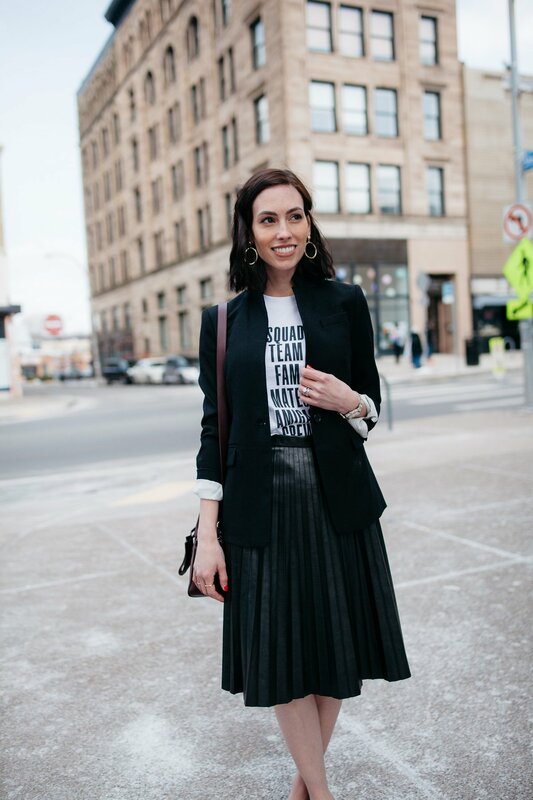 This combination is perfect for work if, like I said, you work in a more creative or casual environment. It’s so comfortable but still looks perfectly professional and chic. It certainly helps to keep the look mostly monochromatic, centered around black and white, and only adding in touches of color/print with the accessories. I linked this handbag below; I think it’s such a chic little bag to have in your repertoire (and totally affordable!). 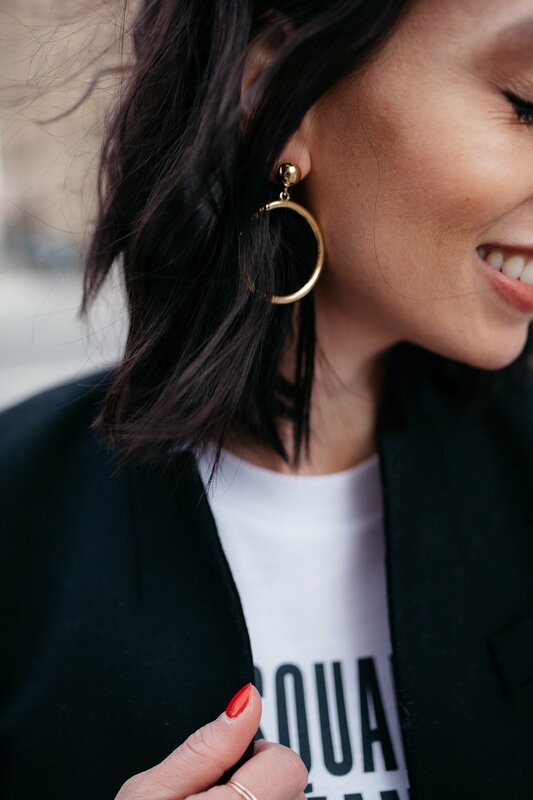 Need a date night look? Here you go. These denim jeans make any outfit instantly cooler–and I need all the cool I can get (#momlife). I reach for them time and time again–easily one of my favorite pieces in my spring capsule at the moment. They work perfectly with this pair of edgy sock booties for a night out–be it a dinner date or cocktail hour! To give this overall look just a touch of color, I added a silk leopard scarf. I felt like it needed a little something extra with all that coolness going on. Playing it casual? 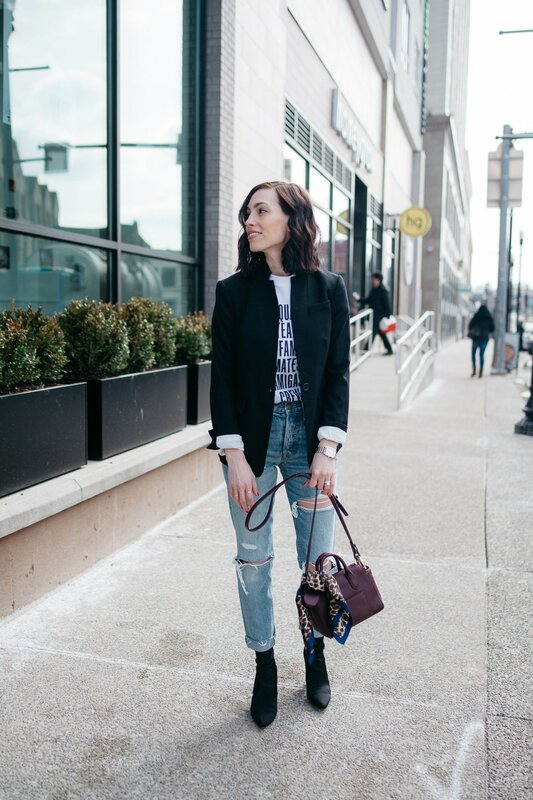 There’s no better option than your favorite white sneakers and worn-in skinny jeans (I think these ones are literally molded to my curves at this point). 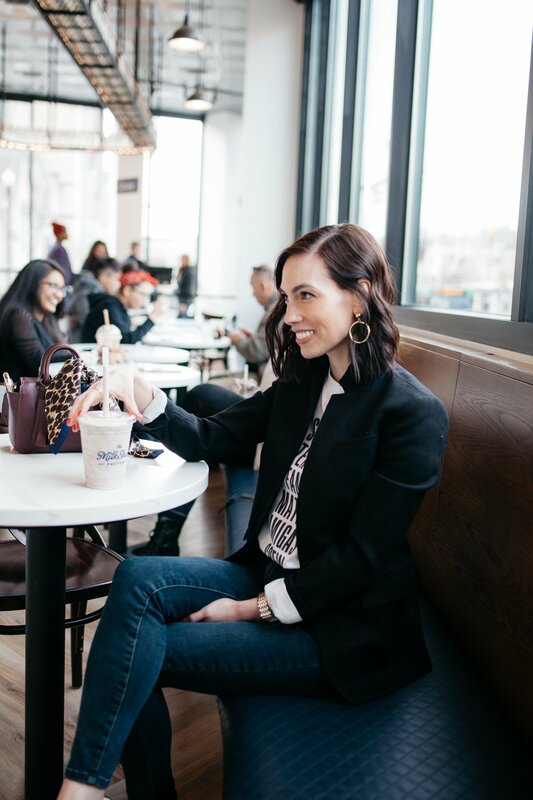 Swap out your pumps and midi skirt for these two comfy favorites, and go grab yourself a milkshake. You deserve it (but, let’s be serious, I don’t actually need an excuse to go get a milkshake. Does anyone? ).